Death marches refer to the forcible movement between Autumn 1944 and late April 1945 by Nazi Germany of thousands of prisoners from German concentration camps near the war front to camps inside Germany. 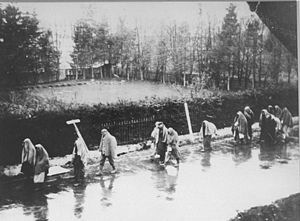 A view of the death march from Dachau passing through villages in the direction of Wolfratshausen. German civilians secretly photographed several death marches from the Dachau concentration camp as the prisoners moved slowly through the Bavarian towns of Gruenwald, Wolfratshausen, and Herbertshausen. Few civilians gave aid to the prisoners on the death marches. Germany, April 1945.